Manchester United star Alexis Sanchez has fans all around the globe, and the player has found a new admirer at Spanish outfit Real Madrid. Los Blancos’ youth player Sergio Lopez, who made his debut for the Galacticos against United in their pre-season tour of USA, waited behind after the final whistle to meet Sanchez. Lopez had come on after in the 62nd minute in Real’s 1-2 loss against the Red Devils. The youngster was helped by Ander Herrera, after he requested the United midfielder to help him meet Sanchez. A United representative then met the right-back, and went to the dressing room to get hold of Sanchez’s number 7 shirt. The player’s reaction after receiving the gift was real touchy. There was a smile and sense of satisfaction on his face as he headed back with the shirt. Sanchez played a key role in that game, and scored the opener after receiving a cross from Matteo Darmian. 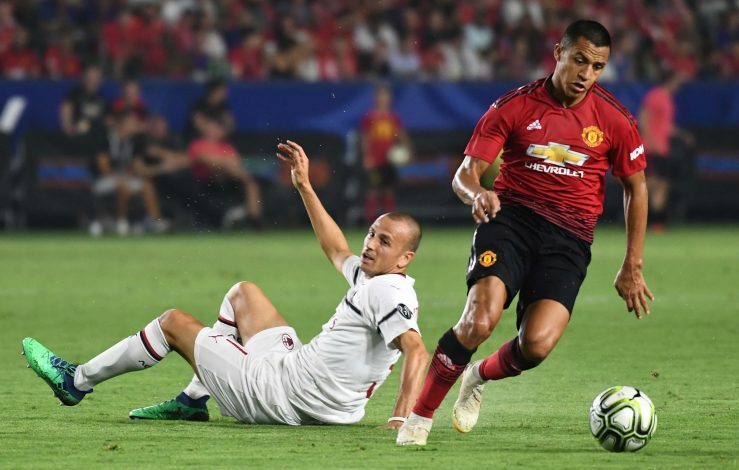 The former Arsenal player will hope to make a real difference for United this season, and the tour of America has given us the glimpse on why he could make his impact tell. Sanchez moved to United in January 2018, but is yet to impress on a consistent basis. But now, the Chilean can show his mettle and get in the flurry of performances once the season kicks off next week.